The final event on the PGA Tour's West Coast swing takes place this week at Riviera Country Club, and it's a monster. Jordan Spieth, Dustin Johnson, Tiger Woods, Rory McIlroy, Justin Thomas and Phil Mickelson make up just part of the crew that will take on one of the best courses on the 2018 slate. Johnson is the favorite for good reason (we'll get to that in a minute), but Woods' return to Los Angeles will be the big story. He hasn't played this event since 2006, when he was still winning eight times a year (literally) and this event was still called the Nissan Open. Woods' foundation hosts it now, though, which is mostly why he's here. It's going to be endlessly intriguing to see him take on an architecturally-adept track in Stage 2 of his umpteenth comeback. Put it in my veins! D.J., McIlroy, Spieth, Thomas, Lefty and Big Cat in mid-February at this course? What in the world did we do to deserve this capper to the pre-Florida Swing?! In all, 14 of the top 25 players in the Official World Golf Rankings will tee it up this week. 1. Who's beating D.J.? Johnson has started three events this season, and he's lost to two people. Justin Rose clipped him by a pair at the HSBC Champions in China last fall, and Ted Potter Jr. (!) got him by three last week at the AT&T Pebble Beach Pro-Am. Those are the only two golfers who have scored better than the No. 1 player in the world in the last three tournaments. Oh, and he sort of owns this course. Dustin Johnson is -49 in the @genesisopen the last 4 years, 20 shots better than any other player in that span. Just like the Masters runs through Spieth, this tournament (and you could argue the Pebble Beach Pro-Am and Tournament of Champions in January) runs through D.J. He might lose, but for you to win, you're going to have to at the very least take down the best player on the planet on a course he clearly adores. 2. Tiger's return: I'm not talking about his return to the PGA Tour. That came three weeks ago at the Farmers Insurance Open. This week marks a return to Riviera following a 11-year absence. I'm not sure this course sets up best for somebody who hit just 17 fairways over four rounds last time out, but a big week feels monumental with his presence. 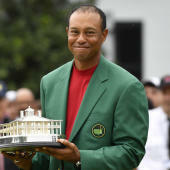 Between the NBA All-Star Game in Los Angeles, this absurd field, this historic track and Woods' aura looming over it all, this event takes up that fascinating space between a regular tournament and a major championship. Like the West Coast Players Championship. 3. Stars setting up 2018: It's hyperbole to say that win here would change the season or even trajectory of somebody like Spieth, McIlroy, Thomas or Mickelson. But all four of them would love to one-up the other as we enter the final lap before Augusta. All four are also looking for the first of this calendar year, and the drought for McIlroy and Mickelson goes deeper than that. McIlroy hasn't won since the end of 2016, Mickelson since the middle of 2013. Watching big names like these try and slay a track like Riviera is always unendingly interesting, so to see multiples of them in the mix on Sunday would be a thrill. Merrick is currently ranked No. 1,280 in the world. I'd be pretty surprised if we saw somebody outside of that Spieth-Thomas-Johnson-McIlroy-Mickelson fivesome take the tournament this week.